In late May, Mikey Revolt from Lowbrow Customs sent me an invitation to join the Fuel Cleveland invitational motorcycle show. Two weeks later, I was standing by the side of the road with the bike that was supposed to appear in that show, my 1933 Harley-Davidson VL, going up in flames. I still haven’t recovered from the string of bad luck that has followed the invitation, but I can’t really blame Fuel Cleveland for that. I thought the show, which features motorcycles from top builders around the Midwest and motorcycle-related art from various artists and photographers, would give me a great chance to put some miles on the VL by riding it the 500 miles from North Carolina to Cleveland. The fire was just the first hitch in those plans. Fortunately, my 1933 Harley-Davidson VL was back together just in time for Fuel Cleveland. Photo by Panhead Jim. How I got that bike back together in time for Fuel Cleveland is a story unto itself, but needless to say I spent a lot of late nights getting it reassembled. I literally finished the bike the night before I was set to leave for Ohio and after a quick test run I loaded it up with gear, planning to spend the next two days on the road heading north. Instead, bad luck struck again and two days on the road turned into just 50 miles before my front intake tappet grenaded and jammed in the tappet block. My trip to Ohio had to be made with the VL strapped to a trailer. Even with a nonfunctioning motor, though, the bike still looked great. A view down one side of the venue. Despite the large crowd, there was plenty of space to walk around and see each machine. Photo by Panhead Jim. 1948 was the last year for the springer front end and the first year of the Panhead motor, making this a highly sought-after model. Photo by Panhead Jim. Fuel Cleveland officially started on Saturday at noon and after a shuttle ride from the hotel I was ready for eight hours of walking around eyeballing motorcycles. 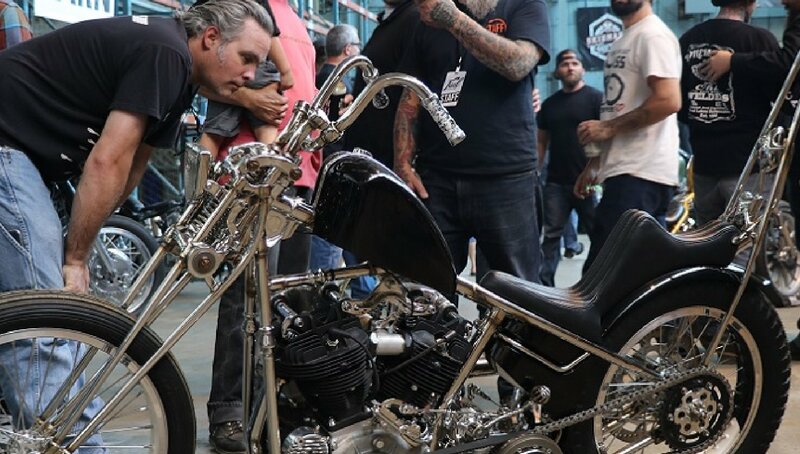 Overnight, the staff had carefully repositioned all the motorcycles throughout the venue, creating space around each machine so that they could be viewed from all sides. Metal fencing and structural components of the building were combined to create a large oval track in the main room, so the crowds naturally moved through the exhibit in a circular pattern. The metal fencing also served as a place to mount the artwork and photos from the 30 artists who were displaying their work. Grail Ogzewalla's paintings were some of my favorites. I just need to talk him into painting some VLs. Photo by Panhead Jim. A total of 85 motorcycles were on display, predominately American-made, with the earliest being from the 1910s. 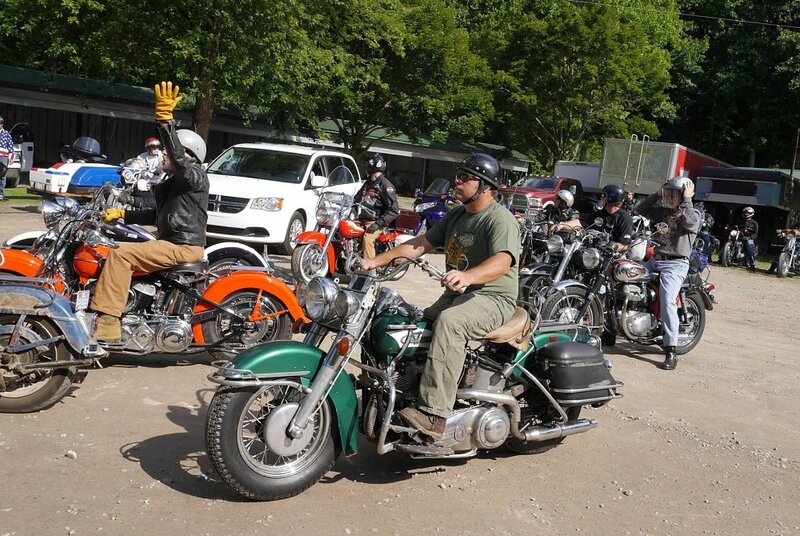 Being that this was an invitational show, the organizers were able to select a group of motorcycles that had a lot of variety while still keeping with that “old iron” vibe. There was everything from race bikes fresh off the beaches of New Jersey to 100-point antique restorations to choppers that looked like they just rolled out of the 1970s. There were fresh builds from big-name builders as well as equally cool machines that guys put together in their home garages. A classic Shovelhead chopper. Nothing extra and plenty of chrome. Photo by Panhead Jim. This one has a few too many carburetors for my taste, but I bet it screams down the road. Photo by Panhead Jim. The motorcycle themed artwork really rounded out the exhibit, adding a touch of “culture” to the event. I really enjoyed the selection of black-and-white photography, as I am always hoping that if I look at enough photos it will somehow improve my own photography. Several artists brought in full-size canvas paintings, whose bright colors drew people away from the motorcycles as they moved closer to check out the details. As in years past, a number of artists were given new fuel tanks that they expertly painted with everything from multi-colored flames to highly realistic roosters. This Model U was passed down from father to son and is now back on the road ripping around Ohio. Photo by Panhead Jim. Outside of the venue, the main courtyard was packed with vendors and food trucks. Since I was there for the entire day, having a few options for food and drink was really appreciated. There were about two dozen vendors to check out, so while I downed a plate of plantains, I was able to look through piles of cool parts, T-shirts, artwork, etc. After a couple hours of careful consideration, I picked up a great piece of artwork from Devil Chicken Design, two rolls of cloth-covered wire from Prism Supply Co. and an event T-shirt (doesn’t sound like much, but I was pretty excited about my purchases). If you are going to have a motorcycle show in Cleveland, you'd better have at least one Cleveland motorcycle. Photo by Panhead Jim. I also spent some time checking out a cooperative motorcycle shop called Skidmark Garage, which was in another wing of the building. For $125 a month, you could bring in your motorcycle, put it up on a lift and build or repair it using tools and machinery provided by the co-op. Not a bad idea in a city where most people don’t have their own garage. Just what everyone needs, a turbocharged Shovelhead. This one was built by Christian Newman. Photo by Panhead Jim. By the time the show ended, I was pretty tired from walking around for eight hours. Luckily, the building was reserved for the entire weekend, so I was able to go to the after party and load my motorcycle on the trailer the next day. The custom touches on this Triumph really turn it from a motorcycle into a rolling piece of art. Photo by Panhead Jim. The nine-hour drive home gave me plenty of time to reflect on Fuel Cleveland and my thoughts were all positive. The event was well executed, whether you were a spectator or a participant. The motorcycles and artwork displayed were definitely top-notch (and I am not just saying that because my motorcycle was included) and the venue had a great vintage feel to it. Also, unlike most old buildings, it was well lit with both natural and electric lighting, so viewing was never an issue. One of best parts is the show is entirely free for both participants and spectators, as one of the main goals of this event is to bring people into the city and give back to the community. It's all fun and games until the drift trike shows up. How this guy didn't wreck into the lines of motorcycles parked up and down the street, I will never know. Photo by Panhead Jim. Plans are already underway for next year’s show and although I hope to be invited back, I won’t be bringing my VL because Fuel Cleveland does not do repeats. Next year will feature 85 completely different motorcycles. That keeps the event from getting stale. Next year's show is July 28, 2018. 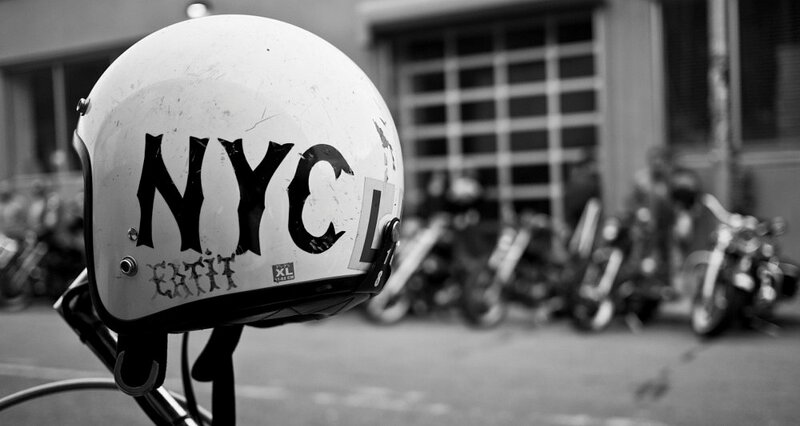 Think your motorcycle or artwork deserves to be included? Contact them at fuelcleveland@gmail.com to see if you can make the cut.